Sift the flour in the food processor, add the vanilla sugar, salt, soft butter and egg. Process shortly until everything binds together. Place the pastry on the work surface and knead quickly to form a ball. Alternatively you can use a hand held mixer with dough hooks instead of the food processor. Wrap the pastry in plastic foil and let rest in the fridge while preparing the fruit. Clean and slice the fruit. Butter a 30 cm/ 11.8 inch pie form, preferably one with a detachable bottom, it will make things easier when taking the pie out of the form. If you only have a ceramic form, it's also OK, just cut the cold pie directly in the form. Roll the pastry on a clean kitchen towel sprinkled with flour. The rolling pin should also be rubbed with some flour. Place the pastry into the prepared pan. Arrange the fruit slices on the crust. Whisk together the egg yolks, double cream, sugar, vanilla essence and corn starch until the mixture is smooth. Pour over the fruit in the pan and bake for about 50 minutes until the edges of the crust are golden brown and the egg mixture is set. Meanwhile roast the slivered almonds in a non-stick pan without any addition of fat. Keep an eye on the pan and shake it regularly to prevent the almonds from burning. When nicely golden transfer immediately onto a plate and let cool. Don't leave them in the hot pan, they will continue cooking and get burned. Place the apple jelly in a small pan and heat gently until liquid. 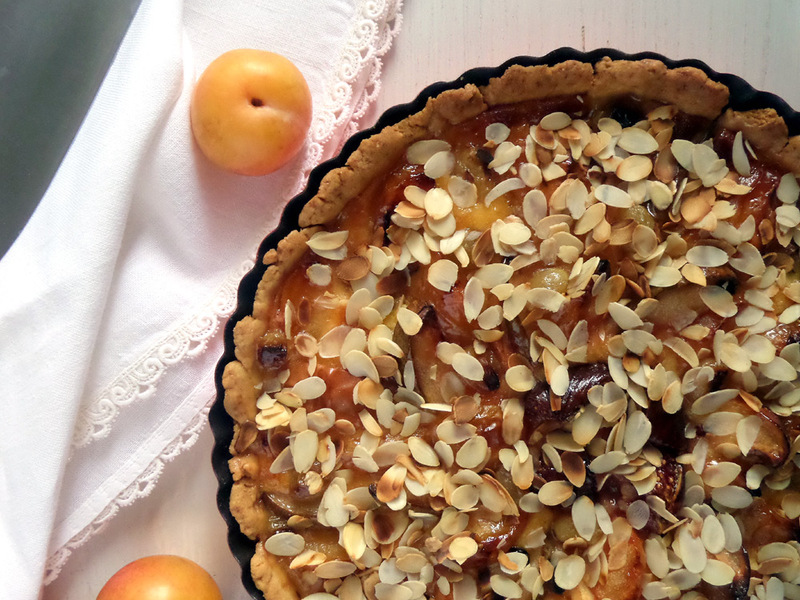 Brush the pie with the jelly and immediately sprinkle the roasted almonds all over the pie. Leave to cool completely.